The burglar, who appears to be female, broke into a business in the town and was filmed on CCTV stealing several items. She was wearing a large Rudolph mask, which she briefly took off near the end of the footage. Fort Collins police appealed to residents with information about Santa’s wayward helper to tell them “so we can notify St Nick”. The burglary was in the early hours of 18 December. But, along with releasing the CCTV footage, police also tailored the classic Christmas song to back up their appeal. Video:A police officer from Fort Collins sings an appeal to find a burglar who wore a Rudolph mask. After the burglary received some publicity on a US TV station, police said they had received “quite a few requests for a musical rendition”. 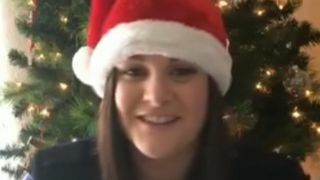 Accordingly, “Officer Sarah”, described as someone who “doesn’t appreciate criminals defaming beloved holiday icons”, lent her singing voice to the cause.